Americans who most often drink Dos Equis are in the middle-of-the-road while drinkers of Heineken’s flagship brand are strongly Democratic. 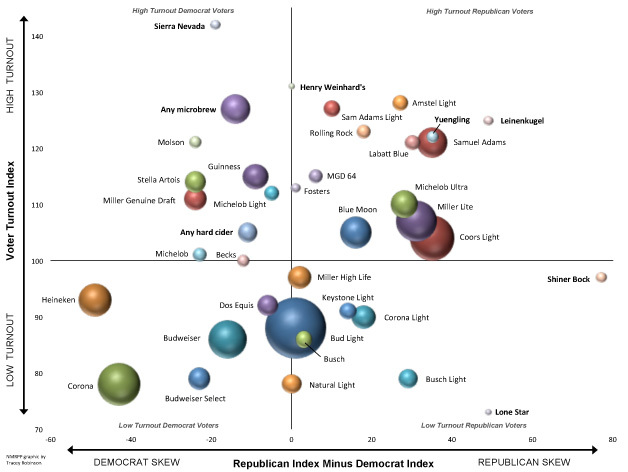 Samuel Adams drinkers are strongly Republican, and more likely to vote. Beer has a long and storied place in American presidential history and politics. Of course, this savvy election-year move was not the first time Obama has played the “beer card.” In 2009, he famously hosted a “Beer Summit” at the White House to help quell racial tensions.